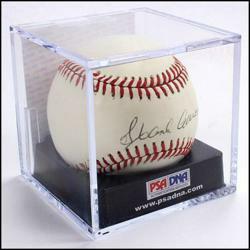 PoliceAuctions.com, home of police auctions and government auctions on the web, will be using social media giant Facebook to auction a PSA/DNA authenticated Hank Aaron autographed baseball. The one-dollar no reserve auction will start on Monday October 8th. During his professional career, Hank Aaron performed at a consistently high level for an extended period of time. Beginning Monday October 8th, PoliceAuctions.com, home of police auctions and government auctions on the web, will be auctioning an autographed Hank Aaron baseball. During his professional career, Hank Aaron performed at a consistently high level for an extended period of time. He hit 24 or more home runs every year from 1955 through 1973, and is the only player to hit 30 or more home runs in a season at least 15 times. Beginning Monday October 8th, PoliceAuctions.com, home of police auctions and government auctions on the web, will be auctioning an autographed Hank Aaron baseball. The Hank Aaron autographed ball being auctioned is a Rawlings official baseball that is sealed in a plastic display cube. The signature is directly in the “Sweet Spot”. PoliceAuctions.com will be using their Facebook fan page to promote the auction for the Hank Aaron baseball. PoliceAuctions.com fans will be able to view photos for the ball and link back to PoliceAuctions.com to bid. The autographed baseball auction will be a one dollar no reserve auction. This means that if the auction for the Hank Aaron signed baseball ends at only one dollar than the lucky winner would only pay one dollar, plus shipping and any applicable taxes, for the ball.